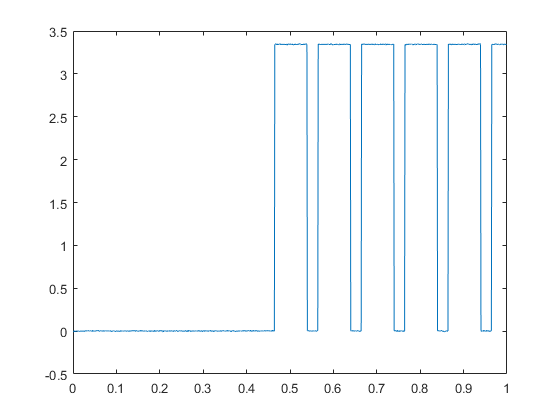 This example shows how to generate a pulse width modulated signal to drive a stepper motor. Create a DAQ Session, and add a counter output channel with PulseGeneration measurement type. An analog input channel is added to monitor the pulse generated by the counter output channel. For this example, use CompactDAQ chassis NI c9178 and module NI 9402 with ID cDAQ1Mod5. To connect the output signal to the correct terminal, examine the Terminal property of the counter channel. The terminal is determined by the hardware. Use counter output channel 0 to generate a fixed pulse width modulated signal on terminal PFI0. Trigger the motor after 0.5 seconds, with a 75% duty cycle. % will contain one column of data.